At the end of April, Theresa May's Tories held jaw-dropping leads over the Labour Party in public polling. The conservatives were hovering in the mid-40's (one headline-grabbing survey had them hitting 50 percent), with Labour languishing in the mid-20's. 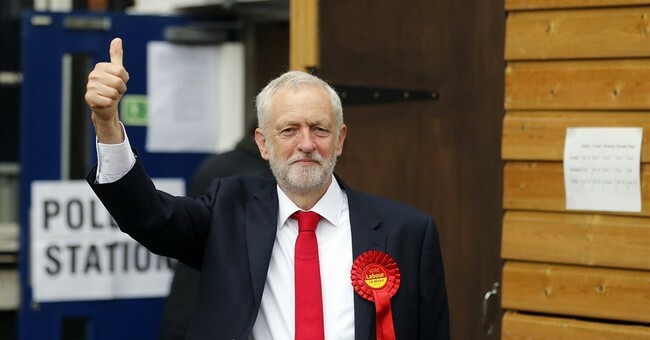 The UK's major left-wing party appeared to be teetering on the brink of a historic wipeout, validating the Prime Minister's decision to call surprise elections. Then, near-catastrophe struck, in stunningly short order. Riding a potent (and somewhat misleading) attack line about Tory cuts to public safety services leading up to several terrorist attacks (and partially blaming Britain's involvement in recent wars for Islamist violence), Labour leader Jeremy Corbyn convinced Labour partisans to 'come home,' as minor-party support collapsed. And May -- whose bloodless, robotic repetition of her "strong and stable" slogan appeared to grate on many Britons -- essentially played prevent-defense as her party's lead plummeted. This evinced an entitled attitude: The polls say I'm going to win, and you don't really have an alternative, because the other guy is a nut. Sound familiar? In the 1983 election, the last time Labour flirted with serious socialism, its manifesto (platform) was described as “the longest suicide note in history,” and a party activist advocated “no compromise with the electorate.” The electorate was not amused, and Prime Minister Margaret Thatcher continued residing at 10 Downing Street. That year, Corbyn was elected to the House of Commons. He spent his next 32 years opposing the monarchy; writing columns for a communist newspaper; expressing admiration for Hugo Chávez, whose socialism propelled Venezuela toward today’s chaos; proposing that taxpayers should be permitted to opt out of paying for Britain’s army; advocating that Britain leave NATO and unilaterally scrap its nuclear deterrent; blaming NATO, meaning the United States, for Vladimir Putin’s war against Ukraine; calling the terrorist groups Hamas and Hezbollah “friends”; appearing with and funding Holocaust deniers and other anti-Semites; criticizing China’s Communist regime for deviationism in accepting some free markets; demanding that Tony Blair, the only Labour leader since 1976 to win a general election (three of them), be tried as a war criminal (for supporting the Iraq War); praising Iraqi insurgents killing Americans; and calling the killing of Osama bin Laden a “tragedy.” Along the way, Corbyn got divorced because his wife insisted on sending their eldest son to a selective school whose admissions policy recognized merit. Last September, in a Labour Party process in which an intense fraction of 1 percent of the British electorate participated — a cohort intensely interested in things other than winning the next election — Corbyn was elected party leader with 59.5 percent of the vote in a four-way contest. He promptly named as shadow chancellor of the exchequer a former union official who lists in “Who’s Who” his hobby as “fomenting the overthrow of capitalism,” who says he was joking when he said that if he could relive the 1980s he would have assassinated Thatcher but who was serious when he praised IRA terrorist bombers. Corbyn’s shadow farming minister, a vegan, says, “Meat should be treated in exactly the same way as tobacco, with public campaigns to stop people eating it.” Corbyn, appearing with unmatched jacket and trousers and with his tie loosened at a St. Paul’s Cathedral service commemorating the Royal Air Force’s heroism in the Battle of Britain, refused to sing the national anthem. Cancellation of President Trump's State Visit is welcome, especially after his attack on London's mayor & withdrawal from #ParisClimateDeal. Ah yes, Chavez's Venezuela, where Socialism's ruinous effects are on daily display, and where international terrorists were afforded safe haven by the deceased strongman to operate and train. Corbyn and Chavez were kindred spirits. By the way, why were global elites across the West unified in panic over the prospect of a Le Pen victory in France, but barely whispered a word about the rise of Corbyn's wild-eyed fanaticism? Ross Douthat has a good examination of that question. My abbreviated take: 'Communist chic' is real.